I have very little information about the early manufacture of semiconductors in Hungary. 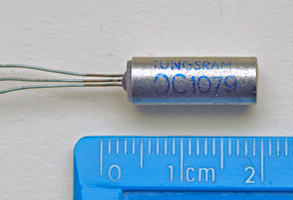 The long-established electrical manufacturer Tungsram, famous for the production of electric lighting, produced germanium transistors in the standard pro Electron series AC, AD, AF and possibly others. They also produced transistors in the Mullard/Philips OC series, and diodes in the OA and AA series. I have no original Tungsram data books or sheets describing any of these. I do know that Tungsram had a building in London; the "British Tungsram Radio Works", in West Road, Tottenham. However I do not know if they manufactured semiconductors there. One source of information about early Tungsram devices is an article by Simoncsics László which was published in the Hungarian magazine "Radiotechnika" in 2016. In one paragraph he says that "Radiotechnika" started reporting on semiconductors in 1957. He goes on to say that Tungsram's first transistors were copies of the USSR types П6, П13, П14 and П15 made from about 1960. This is further substantiated by a Hungarian data book from 1960. This is not limited to Hungarian types, but on pages 73 and 74 it lists Tungsram germanium PNP types P6A, P6B, P6V, P6G, P6D, P13, P13A, P13B, P14 and P15. The suffixes of the P6 follow the convention and the order used by the USSR, although these part numbers are not in the Cyrillic alphabet. Finally, we can see some of these devices on the Web. There is an article about an old radio that contains some of them. (Interestingly, the schematics at the end show the output transistors as 2P6, suggesting that a matched pair was sold). Another site shows some very rusty P6 examples, without any suffix. The P13 is shown on the radiomuseum site. My image shows a P13B. These P types use an encapsulation that is very similar to the USSR 'modernised-П' cold-welded can. I don't know why there is just a letter T rather than the Tungsram logo. I suspect strongly that the number under the part code is a date code in the format month-year, so my P13B coded 88 was made in August 1968. 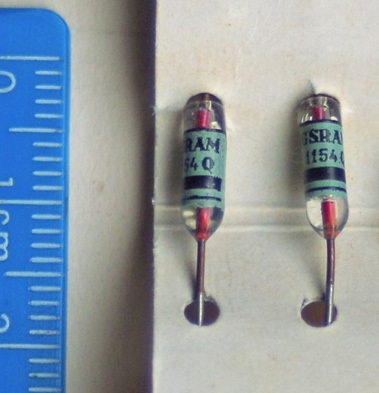 A slight puzzle that I have found are some Tungsram P13AT transistors as shown. I assume that these are indeed P13A, and the extra suffix T denotes that they are in the TO-1 encapsulation rather than the USSR MП type. Here is a Tungsram AC125 in the TO-1A package. 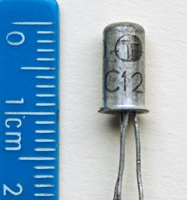 This common type is a PNP germanium alloy transistor for AF pre-amplifier applications, equivalent to the Mullard OC70 or OC71. 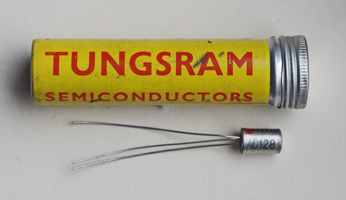 Here is a Tungsram AC128 in the standard TO-1 package, but sold in a rather nice metallic tube that bears the words "TUNGSRAM SEMICONDUCTORS" plus the London address. 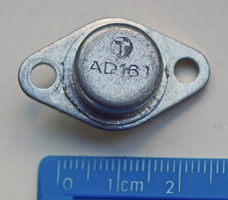 Here is a Tungsram AD161: an early AF 4-watt amplifier transistor in the TO-66 package, often paired with the complementary AD162. 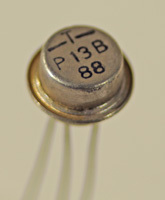 The majority of these transistors were made by Philips/Mullard and Siemens and they can be readily found today. Tungsram examples are rarer. The OC1077 on the left is equivalent to an OC77, but uses the smaller TO-1A can with a clip-on heatsink. 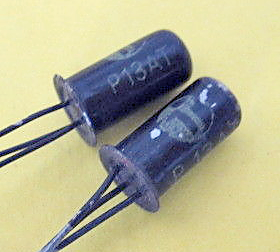 The OC1079 on the right is equivalent to an OC79 and uses a package similar to the Philips SO-2 original. They also did this for ASZnn and possibly other pro-Electron series types. I do not know what these look like. The naming makes me wonder if they are copies of USSR devices. 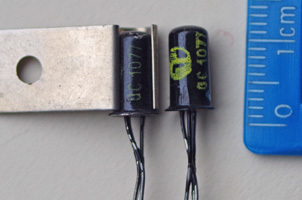 These are all glass axial diodes: my image shows OA1154Q with a greenish decal on the body. I also know that Tungsram made glass point-contact types in the AA, GA and GAZ series, but the book does not list them. The book has sections on germanium junction diodes and silicon diodes, but there are no Tungsram types listed.